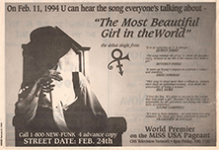 The Most Beautiful Girl In The World was the first single to be released from Prince's 17th album The Gold Experience, the first album to be credited to (although no album was connected to the single at the time of its release). It was also the first single to be credited to , and the first to be released independently of Warner Bros., as well as the first release of any kind from NPG Records (the replacement to the defunct Paisley Park Records). The single was released only five months after The Hits collections, and was clearly intended as a break from the past. It became Prince's first UK number one single, although there were allegations that Prince's organization had bought thousands of copies of the single around the world to ensure its success. 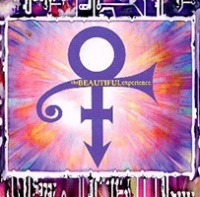 Three months after the single's release, an EP called The Beautiful Experience followed, containing several remixes of the song, each with separate titles (rather than remix names in parentheses). This release contains different artwork also, but is included here, as it was not the only variation. CD singles were also released of the Staxowax and Mustang Mix versions, also included here. Prince wanted to release different tracks independently, but Warner Bros. had required that only one song be released independently, so his response was to put out several different versions of the song, some so different that they could be considered separate tracks. The single's originally-planned b-side, New World, had been blocked for release by Warner Bros., so Prince instead recorded the Beautiful version of The Most Beautiful Girl In The World, which uses many of the same musical elements as New World. For more information on Prince's disputes with Warner Bros., click here. See individual tracks and related albums for credits. This single hasn't been released in digital format. This was the first single to be credited to . This was the first to be released independently of Warner Bros. This was the first release of any kind from NPG Records. This page was last modified on 12 November 2018, at 08:55.